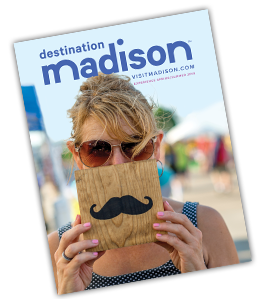 We love that Greater Madison is in the Midwest because it means we get to enjoy four seasons of fun! If you sometimes feel “winter wonder” is synonymous with coming up short on things to do, follow one of these three mini-itineraries guaranteed to give you reasons to celebrate the season! In November, kick off the holiday season at Holiday Fantasy in Lights at Olin Park and Henry Vilas Zoo Lights—a great tradition to try with your family! In December, embrace the flakes by getting gear at the annual (and affordable!) Hoofers Ski & Snowboard Resale. In January, get a taste of Wisconsin at the Isthmus Beer & Cheese Fest. Or, get fancy at Frostiball, the annual gala that benefits Overture Center for the Arts. In February, take part in the Frozen Assets Festival, where you can try fat tire biking, ice fishing and a snowshoe run. Yes, just for fun. Find even more events using the “seasonal” search filter in our events calendar. Ice fishing: Madison’s love of lakes extends to ice fishing season. Get details from the DNR on where to go and how to stay safe. Skating: Ice skating is free at select Madison Parks, and Tenney, Vilas and Elver parks all offer rentals (and warming houses)! Skiing: Start at Devil’s Head Resort, which features 30 different runs that are groomed twice daily! Learn more about snowy sports on our ski and snowshoe page. One of Madison’s most magical—and popular—winter experiences is snowshoeing by candlelight! The City of Madison hosts several of these events, including one at the Aldo Leopold Nature Center and Edna Taylor Conservancy. Traverse trails illuminated by hundreds of softly glowing lights; then, warm up with hot chocolate next to a roaring bonfire. You can also sled “under the lights” at Elver Park, which also happens to be the steepest hill in Madison’s parks system. The park is open until 10:00 p.m. and even rents sleds. A new winter adventure is waiting. Winter Walk with the Wisconsin Union is part of a line of new experiences that showcase Madison in a new, hands-on way. This winter walk with take you out into Madison as a snowshoe-clad explorer. Trek the Lakeshore Path to a bonfire at Picnic Point, or venture onto the frozen waters of Lake Mendota for a surreal view of Madison. Experience Madison is a new way with this walk through a winter wonderland.